Get ready for the biggest game of the year! This touchdown dance-worthy Super Bowl pizza recipe is a quick and easy recipe to enjoy while cheering on your team. I’ve spent years trying to come up with the perfect pizza crust and sauce, and they’re paired up in this recipe. As I said on Big Game Tailgate, I’m hosting more of a chic game day party this year. 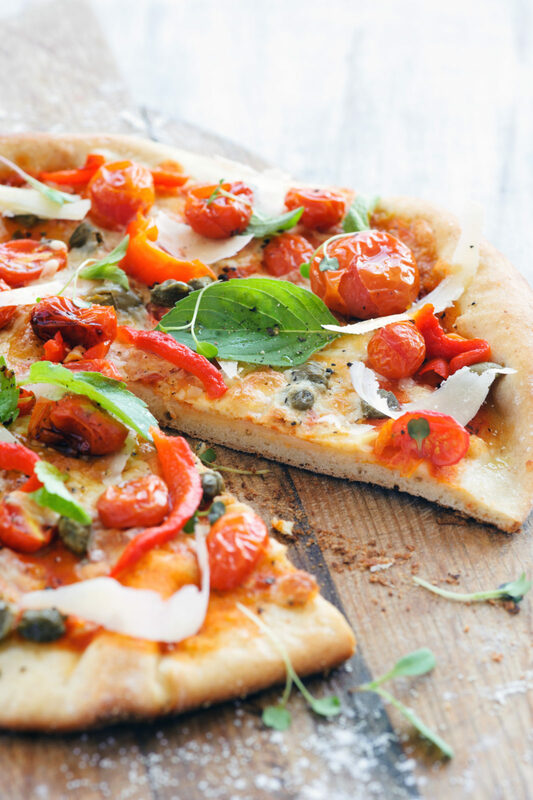 Sweet grape tomatoes, fresh herbs, peppers, capers and shaved parmesan top this tasty pizza. What is your go-to pizza topping? 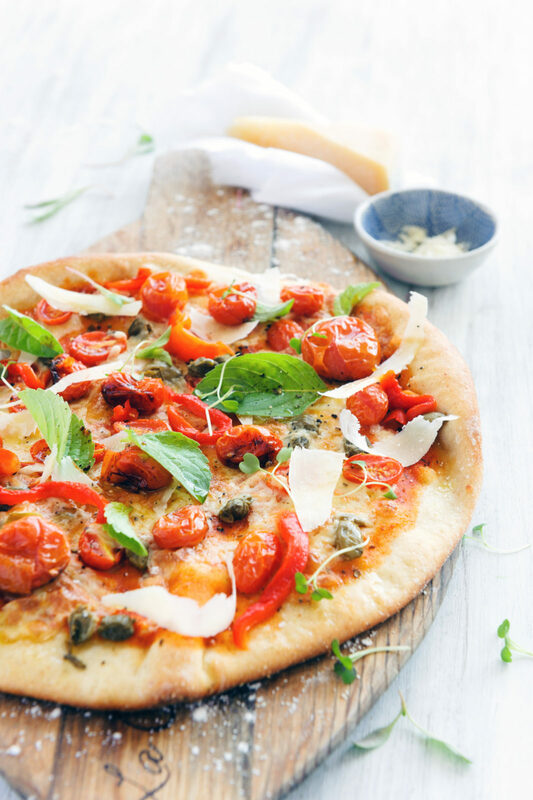 Sometimes less is more on a pizza, especially when you use fresh ingredients like I did here. These are items I typically have on hand all the time so I can make this pizza for a quick dinner if I need to. To make the pizza crust: Combine the bread flour, sugar, yeast and kosher salt in the bowl of a stand mixer and combine. While the mixer is running, add the water and 2 tablespoons of the oil and beat until the dough forms into a ball. If the dough is sticky, add additional flour a spoonful at a time, until the dough comes together in a solid ball. If the dough is too dry, add additional water, 1 tablespoon at a time. Scrape the dough onto a lightly floured surface and gently knead into a smooth, firm ball. To make the pizza sauce: In a medium bowl, Mix together tomato sauce and tomato paste until smooth. Stir in oregano, and garlic. Pre-heat oven to 425 degrees. When the dough is ready, roll out on a floured surface. Top with tomato sauce, sprinkle with cheese, and peppers and cook 10-12 minutes until crust is golden brown and cheese is melted. 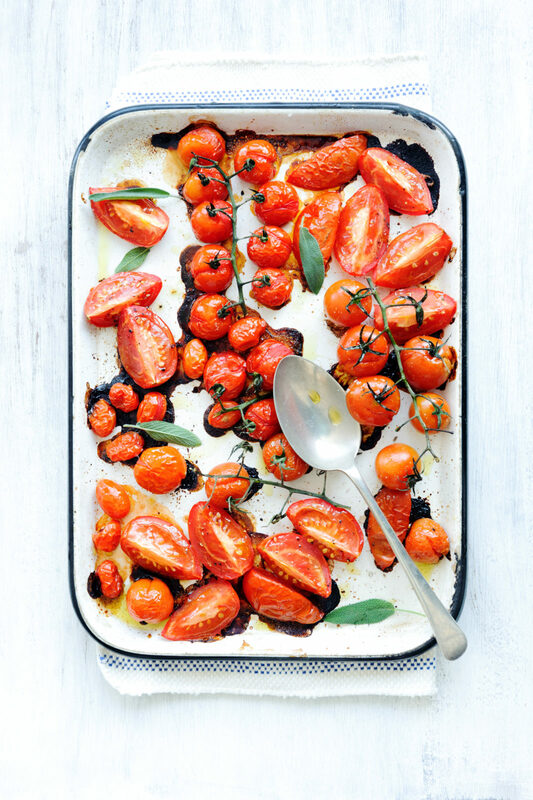 Top with warm roasted tomatoes/peppers, capers, fresh parmesan, and basil.